Theaster Gates: Cultural Collisions for a New Public Space by Betty Nobue Kano. Reviews artistic projects by artist, urban planner, religious scholar Gates that evolve without constraints of history, finance, space or cultural divides to create new spaces in Chicago. The Worlds Inside Gilda Snowden’s Brooklyn Street Loft by Mary McNicols. The many dimensions of this multi-talented Detroit artist's life and work. Index/Sarah Lewis by Andrea Douglas. Profile of Sarah Lewis, a rising, arts professional and scholar. Moving Pictures: 2010 SITE Santa Fe Biennial by Kissette Bundy. Exhibit curated by Sarah Lewis presenting 26 works exemplifying the role of motion picture technology in the creation of contemporary art. Derrick Adams: Building a Body of Art by Jody B. Cutler. 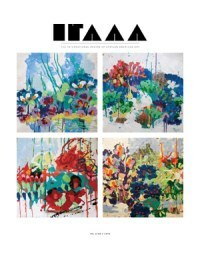 Examines Adams’ artwork in the context of the trend of young artists to embrace diverse mediums, techniques, and forms in a single series and in consecutive individual projects. Art & Pop Culture: Drawing Outside the Lines by Samantha Ragland. Reviews works of several African American artists who use sound, magazines, computers technology to produce non-traditional art. Washed in The Blood: The Paintings of Ben Jones at Southern Alleghenies Museum of Art, Altoona, PA., May 28-Aug. 21, 2010. The New Materiality: Digital Dialogues at the Boundaries of Contemporary Craft at Fuller Craft Museum, Brockton, MA., presenting works by American craft artists who use digital, video, audio, computer and other technologies for artistic expression. May 29, 2010-Feb. 6, 2011. At Home/Not At Home: Works from the Collection of Martin and Rebecca Eisenberg Group Show at CCS Bard Hessel Museum of Art, Bard College. June 26- Dec. 19, 2010. After 1968 Group Show at Bronx Museum, NY. March 28-Aug. 11, 2010. Collected. Reflections on the Permanent Collection Group Show at The Studio Museum in Harlem. April 1-June 27, 2010. On Beauty, Objects, and Dissonance at The Kitchen, NYC, featuring the art of Leslie Hewitt, March 27-May 10, 2010. Global Africa Project at the Museum of Arts and Design, NYC, on new talent emerging from the Continent. Nov. 17, 2010-May 15, 2011. William H. Johnson: An American Modern, traveling exhibit of 20 works by Johnson, Sponsored by Morgan State Univ. and Smithsonian Institution. 30 Americans by Cliff Hocker, at the Corcoran Gallery of Art, Washington, DC, showing works from the Rubell Family Collection. Fall 2011. The Kinsey Collection: Shared Treasures of Bernard and Shirley Kinsey – Where Art and History Intersect at the National Museum of African American History and Culture, Wash., DC. Oct. 15, 2010-May 1, 2011. Usable Pasts: 2009-10 Artists in Residence: Mequitta Ahuja, Lauren Kelley, Valerie Piraino by Cherilyn Wright, at the Studio Museum in Harlem, July 15 – Oct. 24, 2010. Syd Carpenter: A Place of Our Own at Sande Webster Gallery, Philadelphia, PA., featuring Carpenter’s painted ceramics. March 8 – April 3, 2010. Face to Face: Beverly McIver at Boulder Museum of Contemporary Art, Boulder, CO. Feb. 5-May 23, 2010. William T. Williams: Variations on Themes at David C. Driskell Center, College Park, MD, March 31-May 28, 2010. Bearing Witness by Janell V. Blackmon, at Contemporary Museum of Art and other venues in Baltimore, MD on race in art, May 8-July 31, 2010. Beyond the blues: Reflections of African America in the Fine Arts Collection at the Amistad Research Center at the New Orleans Museum of Art, April 10- July 11, 2010. Performing Race in African American Visual Culture Symposium at David C. Driskell Center, University of Md., College Park, sponsored by Driskell Center and Yale University Art Gallery. Sept. 15-16, 2010. A Ledger of the Event in 48 Hours by Teresa Bush. Report on 2010 Porter Colloquium at Howard Univ. honoring Elizabeth Catlett, Peggy Cooper Cafritz, Floyd Coleman, Jeff Donaldson as fearless risk takers and innovators. Close Up: Enwezor by Sharon Patton. Discusses 2010 Porter Colloquium keynote speech by Okwui Enwezor, an international art curator, critique, author from Nigeria. Black Venus 2010: They Called Her “Hottenot:” An Interdisciplinary Symposium by Jody Cutler on attempt to establish and dignify the memory of the Khoi Khoi woman called Sarah “Gaartman.” At New York Univ., March 27, 2010. In Cconversation at MoMA. at the Museum of Modern Art, NYC, discussions by artists Sanford Biggers and Loaraine O’Grady on performance art, March 2010. As Enigmatic as His Art by Lowery Sims on Hughie Lee-Smith (The David C. Driskell Series of African American Art) by Leslie King-Hammond. New Take on Jake by Sharon Patton on Painting Harlem Modern, The Art of Jacob Lawrence by Patricia Hill. Beauty Ideals – Its Your Pick by Kissette Bundy on Posing Beauty: African American Images from 1890s to the Present by Deborah Willis. Black Venus 2010: They Called Her “Hottenot” by Celeste-Marie Bernier. Deborah Willis. On Collecting by Eric Hanks on two publications: The Kinsey Collection: Shared Treasures of Bernard and Shirley Kinsey, Where Art and History Intersect (exhibit catalogue); and Represent:Art and Identity Among the Black Upper-Middle Class by Patricia A. Banks. Basquiat at 50: Jean-Michel, A Personal Recollection by Jennifer Jazz. Making the Connections by Irene Chambers on the photography of Henry J. Ferrand. Derrick Adams, Meguitta Ahuja, Richmond Barthe, Jean-Michel Basquiat, James Brantley, Syd Carpenter, Aaron Douglas, Samuel Dunson, Ella Mae Edwards, Henry J. Ferrand, Donald Fortesque, Theaster Gates, Leslie Hewitt, Rashid Johnson, William H. Johnson, Ben Jones, Bill T. Jones, Jennie C. Jones, Lauren Kelley, William Kentridge, Lawerence LaBianca, Jacob Lawrence, Hughie Lee-Smith, Goncalo Mabunda, Kerry James Marshall, Matthew McGuinness, Beverly McIver, Wangechi Mutu, Richard Bruce Nugent, Valerie Piraino, Tafa Riadzigbe, Kenya Robinson, Robin Rhode, Claudette Schreuders, Berni Searle, Danny Simmons, Julien Sinzogan, Gilda Snowden, Renee Stout, Henry O. Tanner, Kara Walker, Muriell White, Kehinde Wiley, William T Williams.